A modern lakefront executive bungalow on the water yet set back from Wellington Main Street, it is a perfect and peaceful base for exploring The County. Within walking distance: Drake Devonshire, East and Main, Enid Grace Cafe, a Foodland grocery store, Wellington Bakery, the LCBO and countless Ice Cream shops! Wellington Beach, Wellington Park, and the Millennium Trail are also within walking distance. A short drive away you can play a round of golf at Wellington on the Lake 9 hole Golf Course (2 min. drive), or enjoy the sandy beaches of Sandbanks Provincial Park(20 min. drive). Alternately, you could drive the back roads and visit the various wineries throughout Prince Edward County or just enjoy spectacular sunsets over Lake Ontario from the back deck. The open concept floor plan and large floor to ceiling windows facing Lake Ontario is the perfect escape from the city. The living space has a serene gas fireplace and large screen TV equipped with Apple TV. The fully equipped kitchen has lots of counter space and a dining table with seating for 6 and additional seating at the island for 4. The master bedroom with King and ensuite bathroom and a second bedroom with two twin beds, as well as a second bathroom are located on the main floor. Bed and bath linens are supplied. A very large 3rd bedroom is located on the lower level and has a queen bed and crib. The lower level also has a bathroom with a toilet, sink and tub/shower combination as well as a recreational room with a bookcase full of games for all ages, a TV and DVD player and comfortable seating as well as two twin beds for larger families. The lower level also has a washer and dryer and two large sinks in the laundry room. 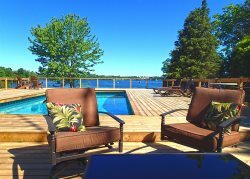 The Large deck has 4 Muskoka chairs and a dining table that seats 6. The lower deck has 3 Muskoka chairs, and 2 additional hi back chairs. There is a propane BBQ at the side of the house, as well as a fire pit by the lower deck. The owners will try their very best to have everything you will need for your visit - such as baby items like cribs, high chairs, plastic plates, bowls, bibs and cutlery…. to things such like a supply of older towels that can be used for going to the beach or going down the steps from the lawn to waters edge (where water shoes are definitely recommended). If there is anything you are not sure of please ask - it may save you some packing!!! Also, change-over dates can occasionally be flexible as well as adding a day or two (at an extra cost) to your week - so please ask. 3 night minimums are required for Family Day, Easter, May long Weekend, Canada Day, Labour Day and Thanksgiving. 3-7 night minimums over Christmas to be confirmed with Owner. This is a waterfront property; however water entry is rocky / limestone and water shoes are recommended.